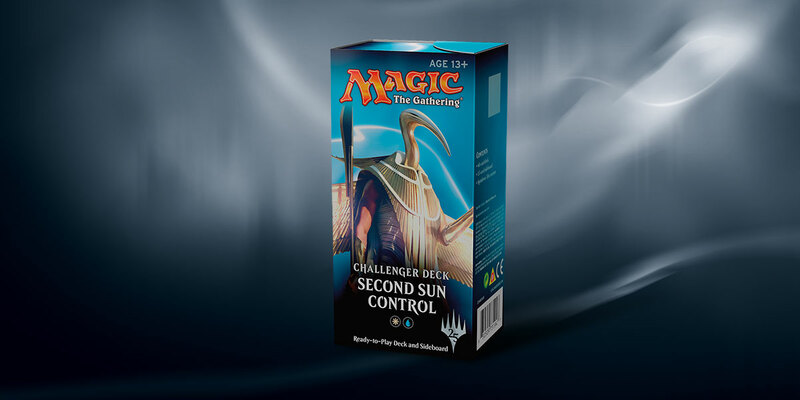 Forged out of proven, powerful strategies in Standard, Challenger Decks are perfect for the Friday Night Magic player or anyone ready to play at their local game store. Who wouldn't prefer to charge into battle protected by a tank, an airship, or some other steel-plated war machine? Let your low-cost creatures join the fight safely by crewing powerful Vehicles, and launch an assault that starts early and doesn't relent until your opponent is roadkill. Combat damage isn't the only way to win a game! And winning with one big spell is a particularly elegant way to do it�all you need to do is survive long enough to cast it. Counter key spells, remove critical creatures, and otherwise disrupt your opponent's plans until your second Approach of the Second Sun wins it all. Do you enjoy having more than your opponent? More life, more cards, more creatures� it's always good to be the player with more! Grab the upper hand and keep it by draining your opponent's resources while your own threats spiral out of control, and capitalize on the bonuses from Winding Constrictor to accelerate you to a crushing victory. 2 Magma Spray 2 Key to the City 2 Pia Nalaar 2 Kari Zev's Expertise 3 Sentinel Totem 4 Chandra's Defeat.